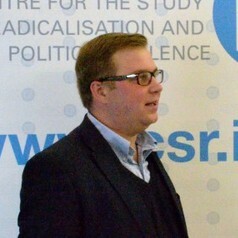 Scott Kleinmann is a Research Fellow at the International Centre for the Study of Radicalisation and Political Violence (ICSR) in London. He specialises in religious extremism, radicalisation, and terrorism in Europe, North America, and Southeast Asia. Kleinmann is the author of the articles “Radicalization of Homegrown Sunni Militants in the United States: Comparing Converts and Non-converts,” in the journal, Studies in Conflict and Terrorism and co-author of "How Rigorous is Radicalization Research?" in the journal Democracy and Security. From 2006-2011, he supported various Information Operations, Public Affairs, and Psychological Operations programmes as a consultant to the US military and other organisations. In 2009, Kleinmann was a visiting fellow at the International Center for Political Violence and Terrorism Research (ICPVTR) in Singapore, researching and writing on counter-ideology programmes. He has earned the David L. Boren National Security Education Program (NSEP) fellowship from the National Defense University, as well as Fulbright-Hays funding to study in Indonesia. Kleinmann attended the Wisconsin police academy, and holds a BA in Criminal Justice from Concordia University, an MA in Southeast Asian Studies from the University of Wisconsin, and an MA in Security Studies from the Edmund A. Walsh School of Foreign Service at Georgetown University. He is currently pursuing a PhD in War Studies at King’s College London. He is fluent in Indonesian and Malay languages.